Jehovah’s Witnesses have long been known for their rejection of blood and blood-component transfusion, even when it is necessary to save life. In a remarkable change in policy, the Witnesses’ governing body announced in the June 15, 2000 issue of its official church publication The Watchtower, that members may now accept “fractions of any of the primary components” of blood. (Italics added) Previously, Witnesses who accepted a transfusion of blood fractions other than those found in plasma faced possible expulsion and enforced shunning by church members. This change in policy has been particularly timely for some Jehovah’s Witnesses. According to a September 24, 2000 article in the Sacramento Bee, a patient was transfused with Hemopure®, a highly purified oxygen-carrying hemoglobin solution made from fractionated bovine (cow) blood and manufactured by Biopure Corporation. “…various tonics and tablets sold by druggists show on their labels that they contain blood fractions such as hemoglobin. So it is necessary for one to be alert… if they are to keep themselves ‘without spot from the world.’—Jas. 1:27.” The Watchtower, 9/15/61, p. 557. As recently as 1998 two officials from the Watchtower Society’s “Hospital Information Services” wrote that Jehovah’s Witnesses “do not accept hemoglobin which is a major part of red blood cells…. Jehovah’s Witnesses do not accept a blood substitute which uses hemoglobin taken from a human or animal source.” Bailey R, Ariga T. The view of Jehovah’s Witnesses on blood substitutes. Artif Cells Blood Substit Immobil Biotechnol 1998;26:571-576. The policy on hemoglobin and other blood fractions was changed in the June 15, 2000 issue of The Watchtower. This latest change has created further confusion for some Jehovah’s Witnesses since products like Hemopure® are derived from large quantities of stored animal blood. Numerous witnesses have questioned the logic of such an internally inconsistent dogma. Some believe that the governing body of Jehovah’s Witnesses is simply changing its long-standing doctrine gradually to avoid legal problems anticipated with an overt change to a policy that has resulted in so many deaths over the years. Hemopure® continues to be investigated and evaluated for human use. While it has been approved for human use in South African and Russia it has shown to increase the risk of death by approximately 30% and has not been able to obtain approval in other countries. The FDA “compassionate use” program has made Hemopure® available where a life-threatening situation exists and compatible red blood cell transfusion is 1) not available, 2) not effective, or 3) not acceptable to the patient. One such high profile case involved a Jehovah’s Witness who was severely injured in the Boston Marathon bombing. His life was apparently saved by the use of the bovine hemoglobin as reported by the Kansas City Star. AJWRB welcomes the progress in blood substitute development as well as the softening of the WTS stance on hemoglobin. 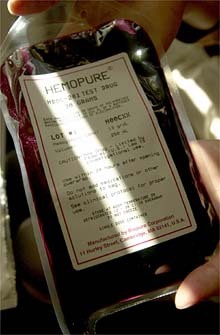 For Jehovah’s Witnesses who are evaluating these issues we would simply point out the kind of tortured logic the WTS is employing by taking the largest single component of blood from an animal (hemoglobin) and saying that a Christian may use it in good conscience while at the same time arguing that a tiny component of human blood like platelets are not permitted. This is certainly not something that can be substantiated with the Bible or even science for that matter. We believe the only reasonable position is to allow individual Jehovah’s Witnesses a free choice in their medical treatment.